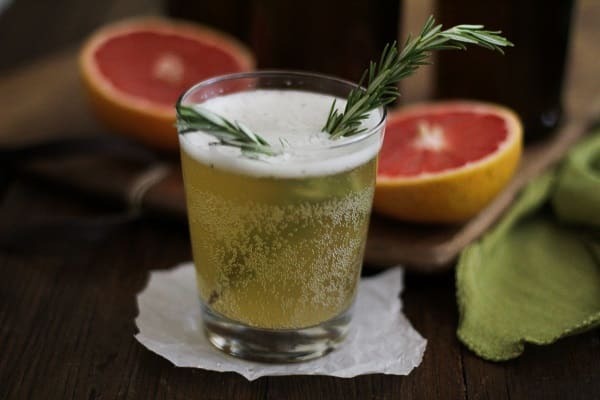 Grapefruit Rosemary Kombucha Recipe from Oh My Veggies! No seriously, kombucha! Have you heard of it? Have you tried it? Do you love it? Would you make it at home? Puuuuuhlease! Doesn’t that require beakers, test tubes and Bunsen burners? Sounds complicated! But it’s not, I promise! Kombucha is a probiotic-rich drink, naturally fermented with sugar, black tea, and a Symbiotic Culture of Bacteria and Yeast (SCOBY). It can be flavored using an array of fresh fruit, herbs, spices, and juices, and it becomes effervescent during fermentation, making it a bubbly tasty treat (and a very healthy alternative to soda!). What’s the buzz about probiotics? They help maintain healthy microflora in your gut, which ensures efficient digestion and aids in nutrient absorption. Essentially, they help you get the most out of the food you eat. Probiotics prevent bad bacteria from attaching to the gut, which starves them of the nutrients they need to survive. This strengthens your immune system, fights disease, and boosts your metabolism and energy level. Folks who suffer from digestive ailments such as Crohn’s Disease, Celiac Disease, ulcers, Irritable Bowel Syndrome, Candida, etc. may find their symptoms improve with regular consumption of probiotic-rich food and drink. I began brewing my own kombucha three years ago when I realized how much cold hard cash I was spending on the store-bought stuff. It required a bit of research and planning, but the initial investment was very small and it took very little time to learn how to do it! I currently brew 2-gallon batches at a time, and each batch takes about 7 days to brew. After the initial brew, I flavor the kombucha using seasonal fresh fruit (and herbs! ), then bottle it and allow it to go through a secondary fermentation. 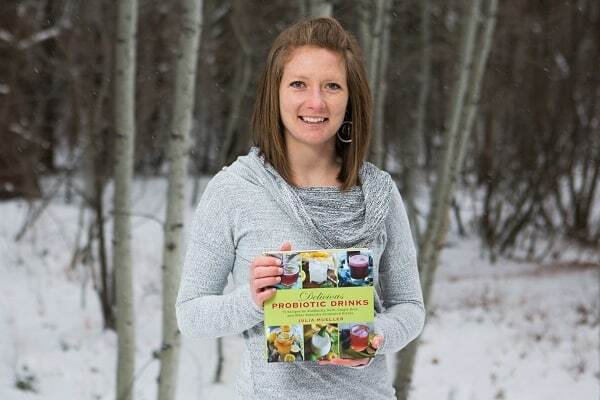 I recently published a cookbook called Delicious Probiotic Drinks, which includes detailed instructions on brewing kombucha along with other probiotic-rich beverages, such as ginger beer, kefir (and yogurt! ), lacto-fermented lemonade, cultured vegetable juice, and more. These drinks may be probiotic-rich, but they’re also chock full of vitamins, minerals, and enzymes, making them superstar elixirs for health and longevity. The book holds 75 recipes for flavoring these drinks in order to make them fun, tasty, and nutritious. My goal for the book was to facilitate the brewing process for folks who are interested in DIY probiotic drinks. The drinks may seem intimidating, but I assure you, they’re easy and fun! The book is great for people who are newbies to fermentation, as well as seasoned brewers. Through experimenting with flavors for my book, I came to realize combining fresh fruit and herbs results in the tastiest drinks! Because citrus fruits are in season, I made a batch of Grapefruit Rosemary kombucha and loved the way it turned out! You can also use navel or blood oranges in place of grapefruit and still achieve delicious results. Note that the recipe calls for 1 gallon of homemade kombucha. And nowwww…Go get your Grapefruit Rosemary Kombucha brewing! 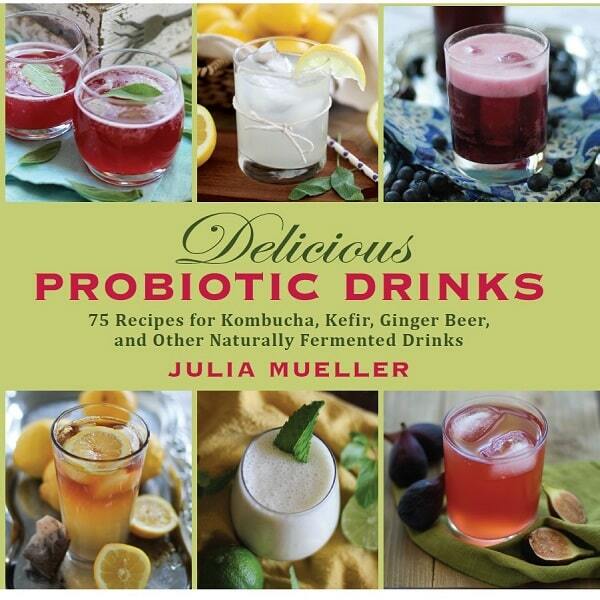 A recipe for homemade kombucha from Julia Mueller, author of Delicious Probiotic Drinks. In a small pot, heat the water to a boil. Add the teabags and sugar, stirring to dissolve. Remove pot from heat. Allow the tea to steep until very strong, about 8 to 10 minutes. Remove the tea bags and discard. Add the grapefruit juice, plus grapefruit pulp if desired (adding the pulp will result in a fizzier kombucha). Let the tea mixture cool to room temperature. Pour the tea mixture (including the grapefruit pulp and rosemary) and the kombucha into a large pitcher (depending on the size of your pitcher, you may have to do this in two batches, using half of the tea and half of the kombucha). Stir well and pour into sealable glass bottles (flip-cap bottles recommended). Keep bottles in a warm dark room, closet, or pantry for 3 days to allow the kombucha to go through secondary fermentation. After 3 days, place bottles in the refrigerator. This will slow the fermentation down, but the kombucha will continue to ferment and become fizzier. When ready to drink, open the bottles carefully because they will have built pressure from the gasses produced during fermentation (look away from the bottles and point them away from your face). Using a fine strainer, strain the kombucha into a glass–this will catch the grapefruit pulp, rosemary, and the small SCOBY that will have formed during secondary fermentation. Keep kombucha for up to a month in the refrigerator. *it is important to use spring or well water because tap water tends to have chlorine and other additives that don’t bode well for fermentation. Julia Mueller writes the food blog, The Roasted Root, and is the author of Delicious Probiotic Drinks and Let Them Eat Kale!. A Lake Tahoe native, Julia loves to play outdoors, and enjoys developing recipes that are nutrient-dense and approachable to make any night of the week. How cool! Congrats on the book. I’ve been hearing and seeing a lot of Kombucha around lately. I really want to try it. Is it usually a sweet drink? I’ve heard it smells … odd. Hey Kate! Yup, kombucha has been exploding, especially here out west. We even have little kombucha microbreweries setting up shop all over the place – it’s gloooorious!! Great question on kombucha flavor/smell. YUP, it smells odd: it smells kind of like vinegar when you’re brewing it, and when it’s not flavored, it even has a natural vinegar/lemony taste. BUT, you can flavor it any way you’d like and make it as sweet as you’d like. I prefer my kombucha on the dry (less sweet) end, but the beauty of brewing it at home is you can ferment it for less time if you want to maintain sweetness to it (the longer you brew, the more sugar gets consumed by the probiotics, resulting in a less sweet drink). Large kombucha companies tend to keep their product on the sweet end of the spectrum. I’d suggest picking up a bottle from the store and giving it a try. It takes some time to acquire a taste for it, but once you do, I guarantee you’ll love it! okay girl, I need to get my brewing on! I love Kombucha but definitely spend to much on the darn stuff at the store. You have just inspired me to get my brew on. I’ll report back! Finally, kombucha gets the sexiness it deserves! Thanks for this. Congratulations on your book! It looks like a beauty! I listened to a cooking podcast on npr sometime in the last year and the topic on The Splendid Table that day was kombucha. I’ve been curious ever since. I’ll have to learn more through your book. I love me some kombu! I live in south texas…I mean SOUTH! Edinburg, tx. (Graduate school) to be exact and unfortunately the nearest wholefoods is 4 hours away…meh. This book sounds legit! Thank God I came across it today. I can’t wait to purchase! Will be going to San Antonio in two weeks and I can’t wait to get some Kombucha! God Bless you Julia & may your book bless many! I’ve grown so accustomed to grocery stores that carry kombucha, I’m always shocked when I can’t find it while I’m traveling. So glad you’ll have the opportunity to stock up! Thanks so much for your kind words, Homer, and have a wonderful weekend! Have you ever tried using Rosemary Essential Oil instead of fresh? I have so much of it, I’m wondering if I could use 2 drops of that instead of 2 TB of fresh rosemary…thoughts? I just flavored my last batch with Young Living’s Citrus Fresh Oil and it’s SO YUMMY! how much oil did you use? What a fabulous, refreshing and pretty drink! Congratulations on your book, Julia! Thanks so much, Georgia! I’m thrilled it’s finally on the shelves, woop woop! Great idea for a book as many, like myself, would love to learn more on this topic. Absolutely love grapefruit and rosemary together. Sounds so refreshing and seasonal! Yippy, I’m glad to hear you like the idea of the book! Probiotic drinks seem to be growing in popularity, so hopefully it will help inspire people to make it at home. Seasonal probiotic drinks are my jam! Can’t get enough. Have a great weekend, Lori! I’ve been on the search for interesting Kombucha flavours; this is now on my list! Heck yes! If you’re into unique flavors, just try a little herbage! I find it adds so much character to the drinks. Basil, sage, and rosemary are all fabulous in kombucha. What great timing- I am on my second batch of homemade kombucha and wasn’t sure what to flavors to use for the secondary fermentation. 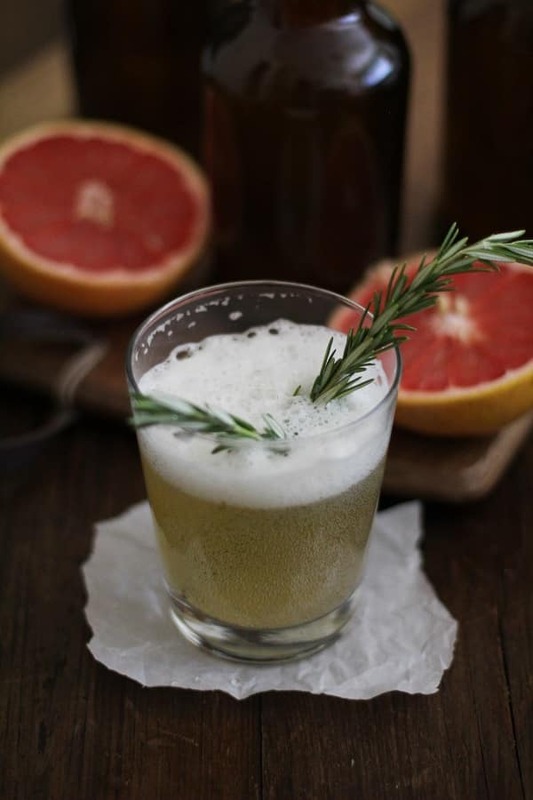 Grapefruit and rosemary sound like a delicious combination! Wahoooo! Let me know if you try it! I plan on diving into the book this weekend! I had another recipe chosen to start out with but maybe I’ll have to make this one since I’m pretty grapefruit obsessed! So glad to hear you’re going to have a probiotical weekend 🙂 Let me know if you have any questions along the way. Tweet me, sister! Congrats on the book. I will need to get a copy for my 17 year old! She loves kombucha but at $3-$4 a bottle it’s is way too expensive so she has been wanting to make her own. You make it sound easier than I thought it would be! Thank you, thank you! Yup, brewing kombucha is pretty dern easy, especially after the first couple of batches. It’s a great project and it’s always fun to understand the whole process from start to finish. Send your daughter my way if she has any questions on brewing. I’d be happy to help out. This just made my day! I am a kombucha-junkie. Unfortunately, I’ve let my scoby die for the 2nd time, and am currently on the search for a new one. I would throughly enjoy reading your book, too. Love experimenting with home brew!! Oh Grace, if you were my next door neighbor, I would give you as many SCOBY layers as your heart desires! I’m always looking for people to take hold of my SCOBYs because I don’t like throwing them away, but I can’t keep up with their growth, ha! Good luck with your next brew and feel free to reach out any time! Grapefruit and rosemary sound like a delicious combo. Tart, citrusy, and earthy–yum! I could use some gut rehab. That looks so good! Congratulations on your book too! It looks fantastic! Kombucha all the way! We make our own and have enjoyed it so much more than the brands we can purchase here in South Carolina! I look forward to checking out your book. Wahoo! So thrilled to hear you’re a fellow kombucha brewer! It’s been a long while since I’ve bottled a batch using frozen berries. I always feel like frozen berries turn out so well in kombucha. I’ll definitley have to do this for my next batch. Hope you like the grapefruit-rosemary! Great recipe! Mine turned out amazing. Question – At what point do you add the rosemary? Step 4? Instructions aren’t clear. Step 4 almost makes it sound like the rosemary is already in the tea but I don’t see any earlier instructions about it.